The woman's black robe is decorated with various Genji mon making allusions to chapters 5, 6, 16 and 26. A couple of the mon appear to be fanciful designs close to the original concepts, but not quite correct. Genji mon are also used to identify different scents that were burned as part of a parlor game. Perhaps that is what has happened considering the green box on the right side of the print. It shows a miniature hibachi in a reset area at the top of it in which the incense would have been burned. 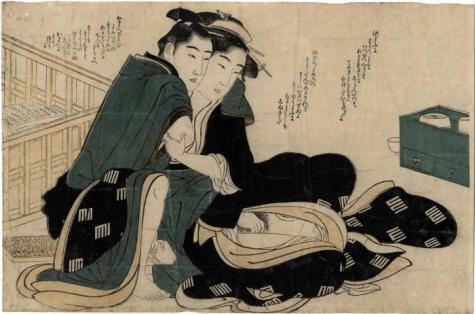 It is often difficult to ascribe a particular shunga print to a specific artist. More often than not erotica was not signed and there were almost none that had a publisher's seal, because this would endanger both the artist and the publisher with punishments meted out by the more conservative elements of the government. And yet, nearly all major ukiyo artists produced such works. This particular print was sold to Mike Lyon by Gallery V in Kansas City. They had acquired from a source that presented it as an Utamaro, a reasonable enough attribution. However, that may not be the case and may have been presented as such either naively or as a selling factor. More than one web site in Japan say this print is by Kubo Shunman (1757-1820). This is probably based on stylistic similarities with his other ascribed shunga prints. There was a series attributed to him by a Japanese author based on the fact that Shunman was known for his benigirai-e, that is, prints with a very limited color palette, mostly "...yellow, purple, green, grey, black, and sometimes light blue." These were popular in the 1780s and 1790s. However, Katsukawa Shuncho was also known to have produced benigirai prints. Our guess, at this point, is that this print is either by Shunman or Utamaro, but most likely the former.